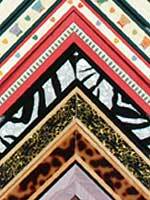 When two or more mouldings are combined into a single frame it is called stacking. The technique of stacking frames dates back hundreds of years. Frames made during the Victorian era are perfect examples. They often featured mixtures of ornate gold with stained oak, velvet, or another contrasting finish. 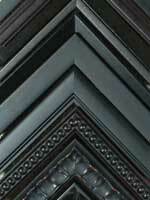 Many Victorian frames boast three or four frames in one! Sometimes each layer varied from the ones on either side of it. A wider, deeper frame means we can achieve the appropriate scale for almost anything you could have to frame. Create a look that will be beautiful with many pieces of art and work beautifully with the eclectic decorating schemes that are so popular today. When you mix moulding colors, you can tie the whole framed piece together, creating a wonderful sense of coordination between art and frame. Highlight a special piece- it's a very effective way of setting apart a small, treasured piece of art- it will look more important and stand out even in a grouping. It makes a statement on any busy wall! Big, blank walls? Stack 'em up! It's a fun way to fill up some serious wall space. When a narrow wood frame is your best design option, but not the best means of support, you can stack a narrow metal moulding inside it to add the strength to hold all the contents. Maybe you want to design your own version of an 'authentic' Victorian look. Many times, also, an inner frame can be used as a mat. We can put glass in between two frames which lets the inner frame hold the glass up off a piece of artwork or needlework. It looks rich and dimensional, and has a practical function, as well. 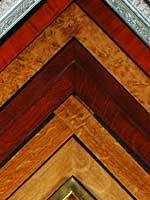 Come in and start your journey into the world of stacked moulding. Play with our corner samples. Come up with several combinations, let us create a variety of looks for your treasures! A nice young couple came to my shop a week or so ago. They had several things with them, including some unusual museum posters of paintings with which I was not familiar. The graphics and background colors were very subtle and nicely done- these would frame up exceptionally nice. They would lend themselves to one of any number of 'right' ways to frame them. Did they get these on a European honeymoon? Yes, they did! This framer loves to see young people putting the forethought and effort into this joint project. What a nice way to remember a special vacation and to be able to decorate their home with something unique and to do it together, as well! I told them this. We talked briefly about what they had in mind (I always find this to be a good place to start) and then: "We just don't want the frame to take away from the picture." Contrary to what must be popular opinion, I don't want that either. My goal as a picture framer is to enhance the artwork. Of course, issues regarding preservation of valuable pieces of art notwithstanding, this may be the primary reason to frame anything at all. Some of us framers consider it a compliment when the framing/matting is not even noticed at an art exhibition. In my business, as in most small framing businesses, framing is done one at a time. Each piece is unique, each piece requires special handling, special instructions, special ordering of materials. Each piece is labor-intensive. Sometimes if I buy a lot of one particular type of moulding (we're talking 100's of feet, here) I will find that my materials costs per unit are lower, but labor does not change. This personal attention is what I have built my business on. 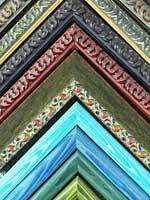 Framing is very inexpensive when compared to other custom-designed and wrought decorating services, but expensive when compared to mass-produced décor items. How often can an average person afford to have a piece of furniture built to their specifications? How often can the average person work with beautifully designed raw materials and create an heirloom that will outlast several generations? This is what picture framing allows anyone to do and at a relatively moderate cost. Never has the picture framing industry offered so much to customers! When I started picture framing 23 years ago this month, never would I have ever imagined the range and quality of choices offered today! I consider it a compliment when a regular customer lays eyes on a new line of moulding and perhaps they are compelled to touch it, hold it and notice the subtleties of a complex wax finish. Then: "I must find something to put in this frame!" My framer's heart swells when I hear this– this is the hallmark of true appreciation. Many times, I am asked, "What type of glass is best for my piece?" The answer is that it varies. Here's a quick rundown on some of the glazing options typically available. The old time standard is regular clear glass. Yes, this is exactly the type of glass sold in hardware store as window glass, except better! Picture glass (as opposed to window glass) is a better quality product. It is often slightly thinner, to cut down on weight, certainly not an issue in window frames! Most importantly, it is amazingly free of flaws. These pesky flaws show up in the form of clear bubbles or icky black specks. These flaws are always distracting in a framed presentation! Regular clear glass has a nice shiny clean, crisp look. There will be reflections on the surface of this glass, especially on dark pieces. These reflections can sometimes be very distracting, sometimes they are quite acceptable. Regular clear glass contains some iron for strength– this is what gives it that distinct green edge and very faint greenish tinge. Next up is non-glare glass now known as reflection control glass. This is regular clear glass that has been acid etched (and completely rinsed) on one side (the outside) to diffuse reflections. It does not exactly reduce glare, it just softens the reflections to make them less jumpy and distracting. It does this at the expense of color intensity and detail. The diffusing works to soften color and detail, usually this muting is not acceptable. I will talk more about the glare issue further down. We use a lot of UV-filtering glass here at Art Etc. One popular brand is True Vue's Conservation Clear Glass This glass looks just like regular clear glass (but for a very faint orange peel texture) yet has a coating (hence the texture) that inhibits the transmission of UV light. It does not stop degradation (fading and discoloring, for example) of art, it merely slows it down. This is an increasingly important consideration. UV light is present in all types of light, not just sunlight and fluorescant light. Your prints are fading as you read this! Light is one of the biggest and baddest enemies of artwork. It is as important to protect your art from damaging light as it is to house your art in acid-free matting and backing. That light damage to art is cumulative and irreversible, is a compelling reason to use glass with this feature. The good news is that this "UV glass" is more affordable than ever due to an increased demand from shops like mine with informed customers like you! Regular clear glass also comes in "extra clear" coined Water White Glass by one major manufacturer, Ultra Clear by another. This is glass that has it's iron removed, no green edge exists! This glass is especially nice on white on white or pale pieces of art. It is rumored to be slightly less strong than regular glass, which may be a problem on large framed pieces. Ask me about it, I'll let you know if it may be a problem on your piece. 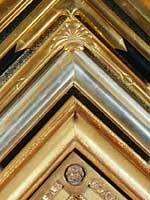 Many of my customers express their desire to find just that right framing treatment. I have good news for them: there is more than one right way to frame any particular piece of artwork! It is more a matter of selecting what is right for your design sensibilities. There are, of course, certain guidelines we follow when framing different types of artwork and I will be sure to respect those during frame selection.